Born with the tribal name Midpul, Prince of Wales grew up with his mother’s people, the Wadgigiyn, on the Cox Peninnsula across the harbour from Darwin. He spent much of his adult life living at the beach camp at Cullen Bay, now an expensive marina development. His father, Imabul, was known as King George and this, perhaps as much as the fact that Midpul danced for Queen Elizabeth during a royal trip to Australia in the 1960s, resulted in his familiar ‘English’ name. Despite suffering a stroke prior to gaining fame as an artist, Prince of Wales was the first contemporary Aboriginal artist from the Larakia region to gain wide renown. From the outset, his art practice and career were nurtured by prominent Darwin art dealer Karen Brown, who arranged all of his exhibitions and his inclusion in major awards. He painted the traditional body designs used in Danggalaba ceremonies, a subject with specific sacred cultural content. Yet such was the respect afforded him, that no challenge was mounted when he began to produce his canvasses. Given the hesitation from the earliest days of the contemporary Aboriginal art movement to disclose sacred symbols to the public his authority may have derived from the fact that there were simply no remaining elders alive to challenge him. Prince’s first solo exhibition was held at Gallery Gabrielle Pizzi in 1997, and he went on to stage another four at the Karen Brown Gallery in Darwin and the Hogarth Gallery in Sydney. He had works included in the National Aboriginal and Torres Strait Islander Art Award five times and in 2001 he won the National Aboriginal and Torres Strait Islander Art Award in the General Painting Category. It is not difficult to see why his paintings were so quickly taken up by the art buying public, once they came to prominence. The bold colours, broad dots and domino-like lines fit a very contemporary aesthetic. Unfortunately, strong commercial interest only manifested at the end of his life. He died just as his artistic career was only really beginning to flourish and commercial interest had begun translating into real sales. For this reason a great deal of his output was on a small scale, executed on cardboard scraps, paper and found objects. The work Body Marks illustrated is a case in point. Created at the end of the 1990’s it measures just 60 x 45 cm and has a powerful aesthetic presence. His works first appeared at auction in 2003, the year following his death. Of the 26 works offered for sale all but 4 have sold resulting in an 85% success rate. Ten of these have exceeded at the high estimate and all but one of the remainder has sold in the mid-estimate range. This is quite extraordinary when compared to average results across all Aboriginal artists at auction. He painted large-scale canvases only toward the end of his career and these account for all of his highest results at auction. Only five paintings have recorded sales in excess of $20,000 and his second highest result was the $42,000 achieved for a 161.5 x 125 cm canvas at Sotheby’s Australia in 2006. Yet his record sale was the staggering $156,000 paid for a 146 x 205 cm canvas bearing Karen Brown and Alcaston Gallery provenance. Carrying a presale estimate of $50,000 to 70,000 this work tripled its estimate at Sotheby’s in July 2007. There is no doubt that major paintings by this artist will increasingly attract interest from informed collectors, with consequent growing prices. Along with their deep cultural significance, works by Prince of Wales fit perfectly in to a contemporary aesthetic. They are expected to continue escalating in value thereby rewarding their collectors both visually and financially. 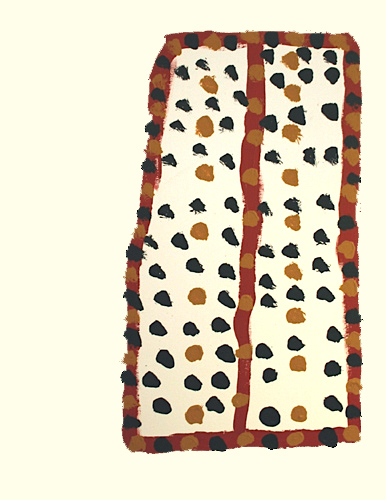 This review is by Adrian Newstead, a leading Aboriginal art consultant. As part of this informative series, Adrian profiles a selection of Australia's 200 highest selling and most successful living and deceased Aboriginal artists. Each profile contains the artist's primary and secondary market results. They have been written to assist collectors in learning more about the artists behind the paintings, and the place of each artist in the history of the development of specific regional styles. Adrian Newstead is the owner of Cooee Gallery in Bondi, Sydney. Statistics supplied by the AASD (Australian Art Sales Digest) which ranks artists according to performance indicators relating to secondary market sales.